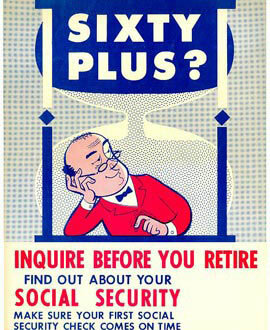 A 1959 poster from the Social Security Administration points out the need to plan for retirement. Image Courtesy of Social Secutiry Online. Retirement age is the age at which people stop working and usually begin to collect a pension. The 1935 Social Security Act set the age at which workers could begin to collect social security retirement benefits at sixty-five. Now the earliest age of eligibility is sixty-two. But because Social Security retirement benefits do not require “retirees” to leave the labor force many workers find new jobs after they retire from their main job. This way they can collect government retirement benefits while working in a new job, although their retirement benefits are reduced accordingly. Many workers also have company pensions or Individual Retirement Accounts (IRAs) that provide them with another source of income in their retirement years. The employer and the employee both contribute a specified amount monthly into the employee’s retirement account so that when the employee retires he or she will have money to live on.